In a video game, it’s nice if things happen. By this, I mean more than mechanic-based happenings, like picking up health packs or shooting evil robots with lasers (though these are important as well), but instead having things happen in the game’s world. Examples might help. In No One Lives Forever, if you flip a switch on the wall, you’ll turn out the lights. In BioShock, if you pick up the shotgun, a horde of enemies will come after you one by one. In Star Wars: The Old Republic, there are tasks which include standing in an area and using your radio to call in an airstrike. When you play these games, the results of these actions make sense. None of these actions, however, are intrinsically tied to the result, at least within the logic of a video game. There aren’t any wires tracing from the light switch to the light bulbs above, just like there aren’t any enemies lurking about and waiting for you to grab the shotgun (I’ve checked! ), and just like there aren’t any military coordinators smoking death sticks and waiting for Darth NarutoFan to make the call. Instead, this is all handled by an event system. This is a standard in game design; I’ve yet to play a game where doing something never resulted in a product. It can be as small as unlocking a door or as massive as dropping a skyscraper, you need some method to connect your trigger to your event. When you play our upcoming Alpha, you’re going to see the first stages of us developing that event system. We’ve been talking a lot about creating dialogue lines for the player to come across as they’re playing. It’s true that we want these lines to give you a sense of the world’s eventual life in a way that is hopefully entertaining, but they also have a secondary goal: we need to figure out what sort of event triggers we need for Gears of Eden. In the alpha, the only events that you’ll see are those dialogue lines, but even they have a wide range of triggers. 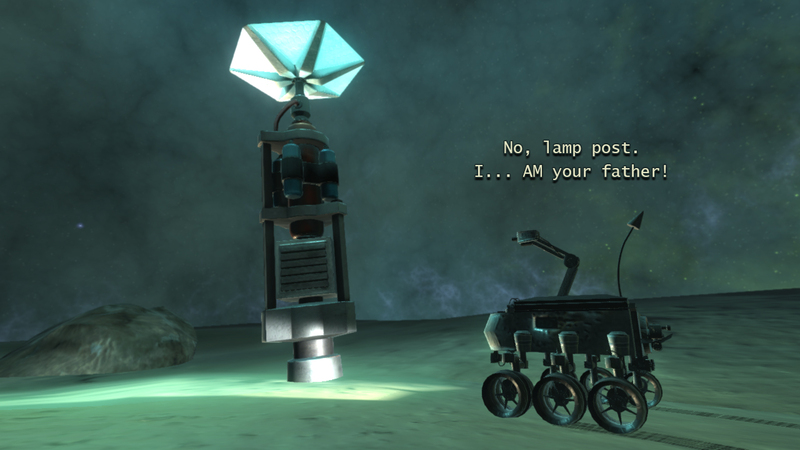 Many lines of dialogue involve proximity to certain objects. Others are triggered by you doing something … and then there are even some triggered by you not doing anything at all. Some are time based! There are even trickier ones, like a dialogue line that involves the player camera having something specific in frame, or others that require other events to have triggered. It’s going to look simple in the alpha, because at this stage it really is! It’s a massively important stage of development though, and any feedback you can give us on the functionality of it will be greatly appreciated! After all, the alpha exists to give you a look at the game and help us make it the best game we can. That’s it for this week’s Dev Update, but before I go, I should remind you that the first ever Reaching Eden Podcast is up! You can find it on our site, but it’s also available on iTunes, Google Play, Stitcher, TuneIn, and SoundCloud. We hope you like it! We’ll be back next week with another Dev Update, so be sure to follow us on Twitter and Facebook to get all the latest and greatest news on Gears of Eden. As always, thank you for your support and we hope to see you next week.